Like I had previously mentioned, before moving to Africa, Joe and I had no plans nor desire to travel to South Africa. SA has a pretty bad rap and I suppose rightly so. If you look at the numbers, the crime rate is huge. From what I gather, Johannesburg is a pretty rough city and even some locals cautioned us about going there (we didn’t) because of the violent crime. One of our hosts in Cape Town explained that there is still quite a bit of crime but it is mostly gang-related and seems to stay in certain areas. However, even in the nicest of areas, you do get a feeling that all is not perfect as houses are laced with razor wire and signs of armed response are seen on every gate. Before I scare you, and perhaps Joe and I are a bit more immune to this sort of stuff now, we had absolutely no problems in Cape Town and we felt perfectly safe at all times. Our hotel was on the edge of the city centre and we were able to walk short distances at night without a worry. We were never hassled by anyone nor did we ever feel uneasy about where we were. After having such a great experience at Kapama Karula, we both wondered how Cape Town and our next accommodation would measure up. Often times when travelling, Joe and I try to book into smaller, boutique style hotels as they always seem more personal and are often just as nice, if not nicer, than many of the large scale hotels. Cape Town is plum full of these and the decision was difficult but I ended up with “Rouge on Rose” which is owned and managed by a mother-son team, Ursula and Michel. I think they may have been English (they didn’t have the South African accent) but Ursula did mention that they’ve been in SA for over 20 years. Our room at the 'Rouge on Rose' hotel. This hotel was by far, one of the best we’ve stayed in and mostly due to Ursula and Michel. They were the perfect hosts and from the moment we entered, we felt like family. We were greeted with a bottle of champagne in our room (honeymooners!) and Michel right away recommended a German pub in the basement of a church for a casual bite to eat on our first night. Joe was in love! They didn’t hesitate to do whatever we wanted or needed from reserving us a table for dinner to renting us a car to personally drawing up maps for us. I cannot speak enough about them or their hotel but it certainly was fabulous! We always start with a "Hop On, Hop Off" bus tour to get acquainted with the city. We took a cable car up to Table Mountain to check out the views of the city. It was pretty high and the trips up and down were a bit scary but the views were extraordinary! Camps Bay below where you can find the who's who of Cape Town having cocktails on the beach. Clouds spilling over the edge of Table Mountain. There were so many things to do. We were there 8 days but could have easily spent more time and not have been bored. We dedicated one full day to learning where we started off at the Slave Lodge which is one of the oldest buildings in town. 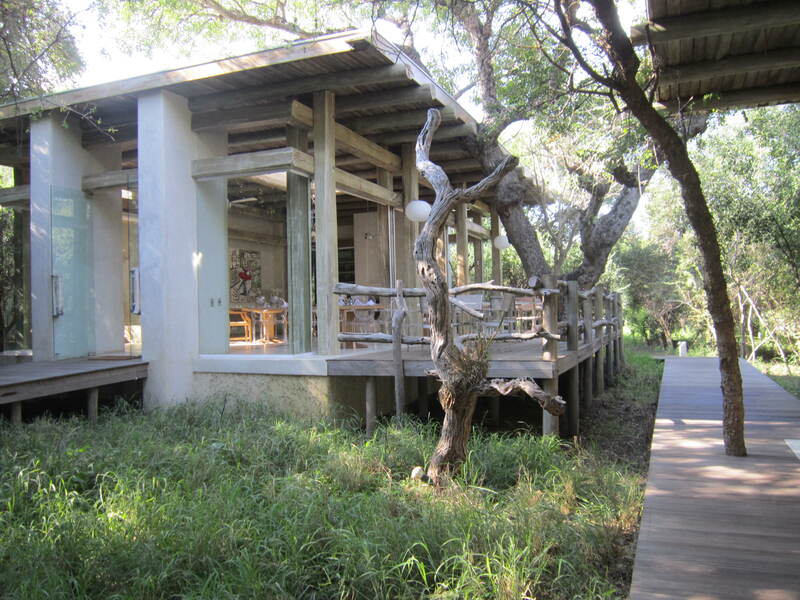 It was originally owned by a Dutch trading company when they first settled in SA and was used as a house of the slaves they brought in from the East. I found it really interesting that the Dutch did not want to use the locals as slaves as they felt it might create hostility (duh) so they brought slaves in from India, Malaysia, and others. The museum began with the story of slavery in South Africa and then ended with an exhibit of Nelson Mandella’s life. From there, we caught the ferry to Robben Island where Nelson Mandella and countless other political prisoners were kept during the apartheid era. Nelson Mandella spent 18 of his 27 years of imprisonment in this cell. This tour was led by an ex-political prisoner of Robben Island and he made it very clear that while the conditions in prison were far from ideal, they wanted a story of hope to come through. They called the prison ‘The University” as they figured this was the time to educate themselves and each other. History is made. Apartheid is abolished and Mandella becomes president in 1994. His path is so inspiring. Aside from learning, shopping and eating, we did rent a car and venture out of the city which is a must. We did spend a day out in wine country although, we never did actually stop in at any of the wineries. (Lame, I know!) We were just enjoying our drives through Stellenbosch, Franschhoek and Paarl. We stopped at a berry farm for lunch just outside of Stellenbosch. We also went out to Cape Point but unfortunately it was cloudy, only on the point so we didn’t get to see a whole lot. We went to Boulder’s Beach to check out some penguins and got to see a lot of baboon’s and ostriches. The highlight had to have been Chapman’s Peak Drive which loops back around to Hout Bay and Cape Town. The road was actually carved out of the mountain. I spent the time ooing and awwing and Joe was cursing as he was driving the winding road and it was hard for him to catch all the views. Luckily there were several pullouts and we were able to take in some of the best views we’ve ever seen. Just off Chapman's Peak Drive with Hout Bay in the background. We loved every minute of the trip and getting on the plane at the end of it all was a bit of a struggle for both of us. I’m quite sure if either one of us would have turned to the other and said “Let’s not go” we’d have run off that plane quicker than you can imagine. Cape Town is fantastic and while it has it’s problems we found the people wonderfully nice, the food delicious, and it’s so full of culture and things to do. 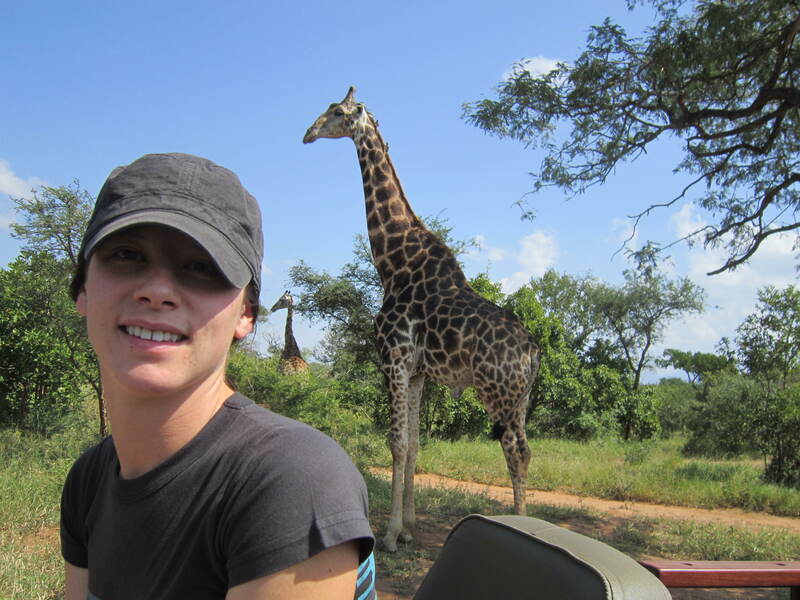 I highly recommend a trip, after your safari of course! 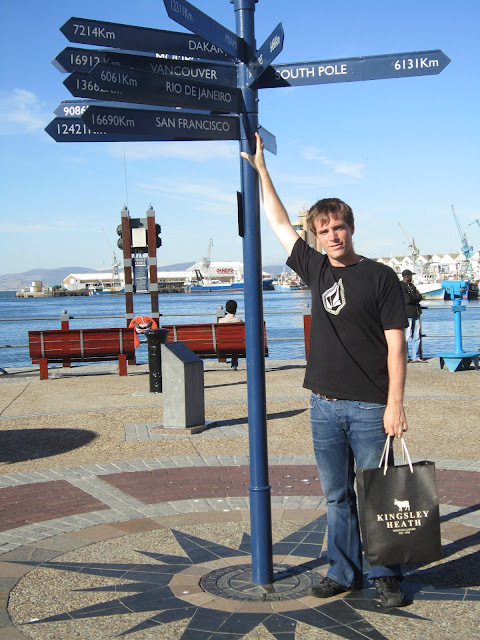 Vancouver was the furthest distance on the sign. We were over 10 000 km closer to the South Pole than we were to the West Coast of Canada! Looking back on one of the beaches in Cape Town. 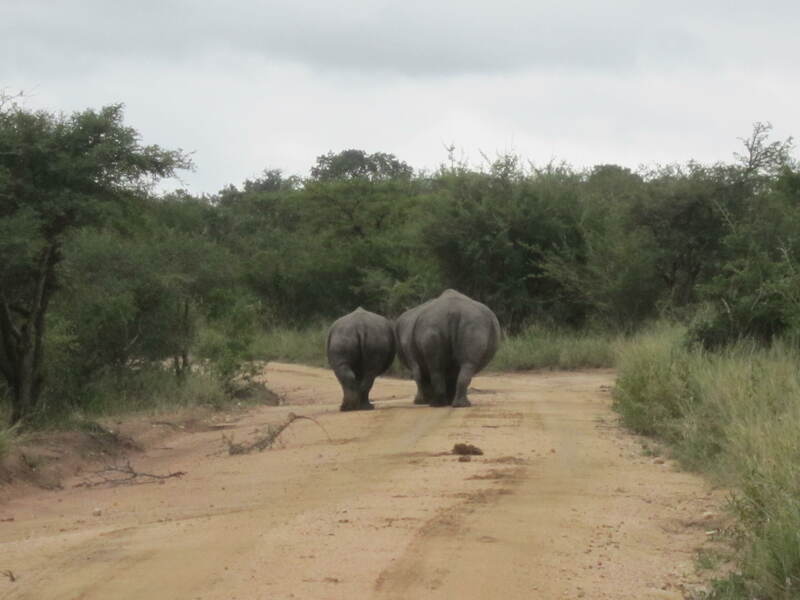 Our visit to Kapama included 2 game drives every day. Each morning we’d get a wake up call at 5 am. (I know, 5 am on holidays is not really that appealing but when you know you are there to see animals, you must get up early!) We’d meet for a light breakfast at 5:30 and take off thereafter. Guiding us each drive was our Ranger, Mike and our tracker Vusi. Vusi would sit on the small seat on the front of the vehicle and both him and Mike would watch for tracks and other signs of animals like how the grass was packed down, birds in the areas and animal droppings. They would be able to tell how old the tracks were and we’d head off and try to find the animals. Sometimes, it was unbelievable how they’d be able to see such a small mark and know exactly what it was and when it was there. Vusi sitting out front with the ranger Mike in the driver s seat. 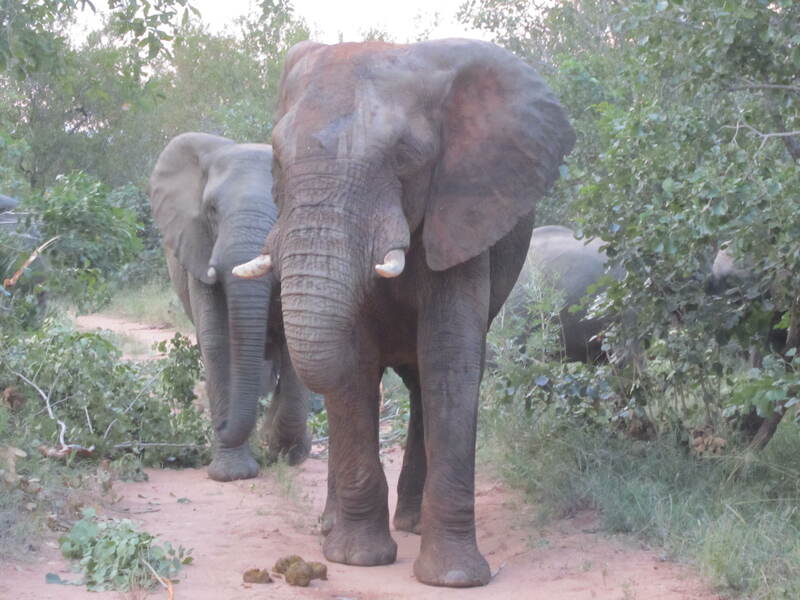 The elephants always seemed to leave a trail of destruction so it was usually easy to see where they had been. We could get pretty close to these guys but the dominant male let us know when we were too close as he’d approach and flap his ears, causing us to move back. They are giant, beautiful animals and you could easily just sit quietly and watch them for hours. Telling us they need a little space and we certainly don t want to mess with him! Some animals were seemingly easy to find (impalas, buffalo, warthogs) while others alluded us for days. Our ranger had led us to an area where he believed one of the female leopards had been staying so we hoped we’d see her lazing in a tree. 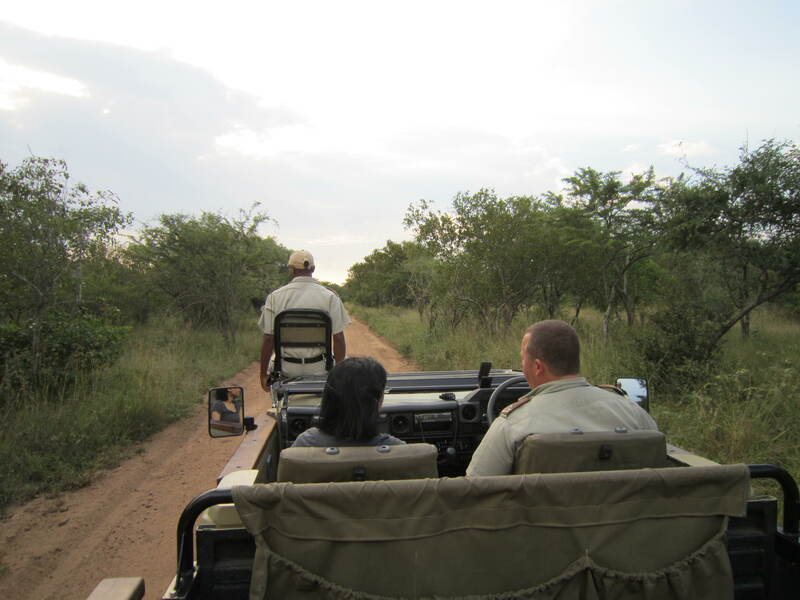 As we neared the area, Mike and Vusi stopped the vehicle and jumped out quickly to check out some tracks. After agreeing that she had just been there, off we go to track her. It was probably the most exhilarating hour of the entire trip. We’d speed off in the direction of the tracks and when they stopped, Mike and Vusi would get out and investigate only to jump back in and speed off again. 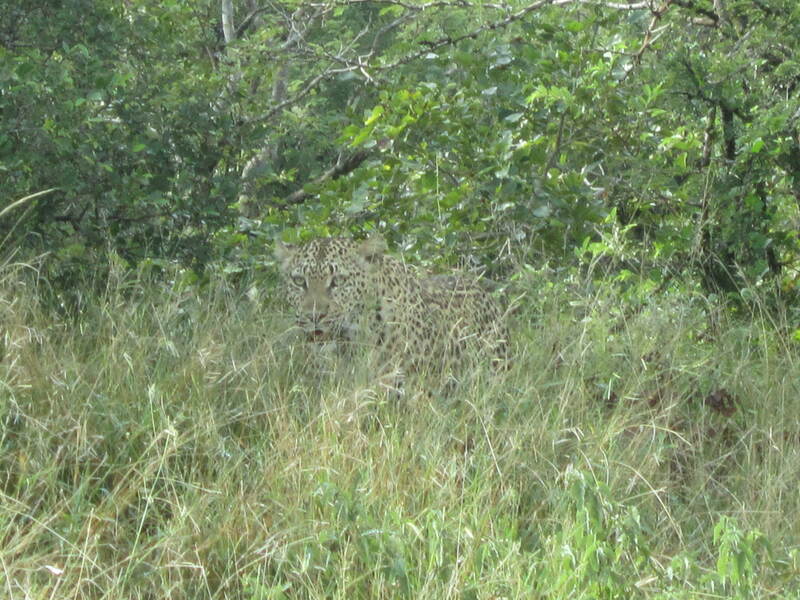 The leopard always seemed to be just a few steps ahead of us and that day we never did catch her. A couple of days later, we got word she was hunting in a different area so off we went again and this time, we found her. We couldn’t follow her for very long as she really wasn’t happy that we were on her trail but we did watch her until she did a leap and a growl. The animal that surprised me the most were the giraffes. You really have no idea how large they are until you are standing a few feet away from them. Male giraffes can get up to 6 metres tall! You can spot the females by the black tuffs of hair on their horns. We did some tracking on foot on morning and got close to some giraffes. Before we could see them, we felt the vibrations in the ground as one had started to run. Because Kapama Karula is such a small lodge, our safari vehicle was never full. For the most part, we had 2 or 3 other people with us but near the end of our stay, we had the entire vehicle to ourselves. This was great because the plan revolved around what we wanted to see. It was also nice to be able to talk with Mike who was a wealth of knowledge about the animals. 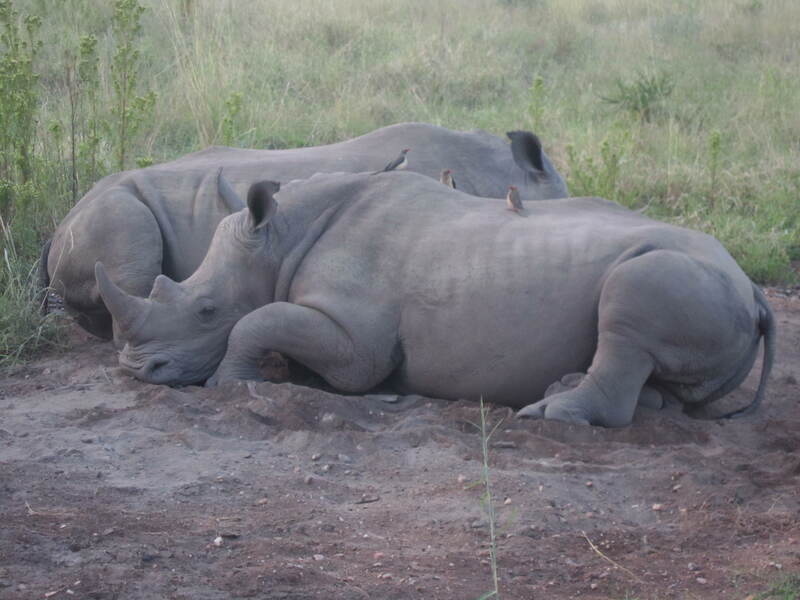 Rhinos - There were always little birds hanging out on the big animals. They eat the bugs on them. 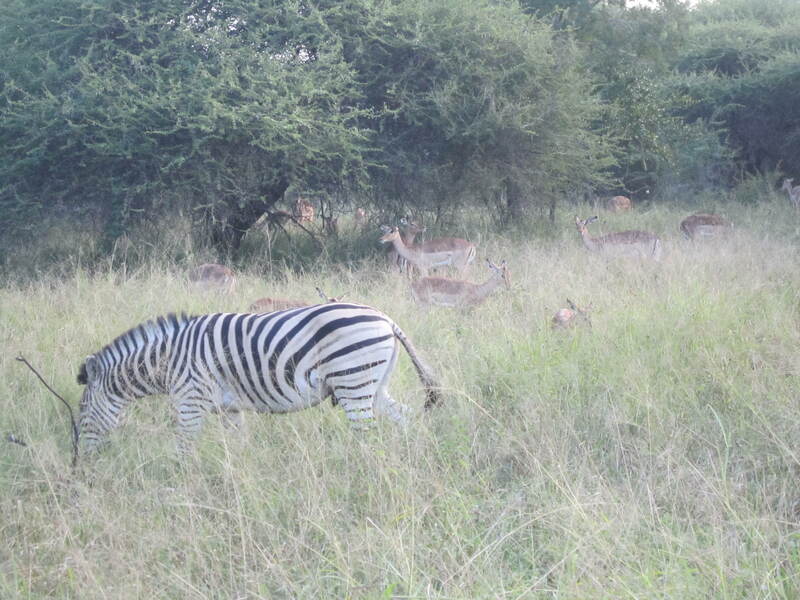 A Zebra hanging out with some impala. 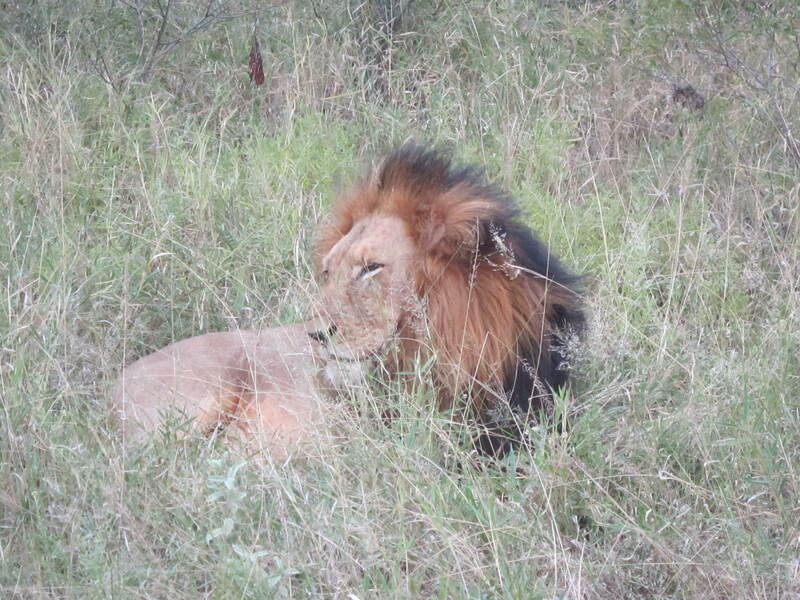 On the first day, we came across a lion and a lioness lazing around in the grass. During the day when it’s hot, they aren’t very active. We were able to get quite close to them in the vehicle and they didn’t really bat an eye. We were probably less than 10 feet away from this guy. The lioness was often ahead of the lion trying to find some prey. 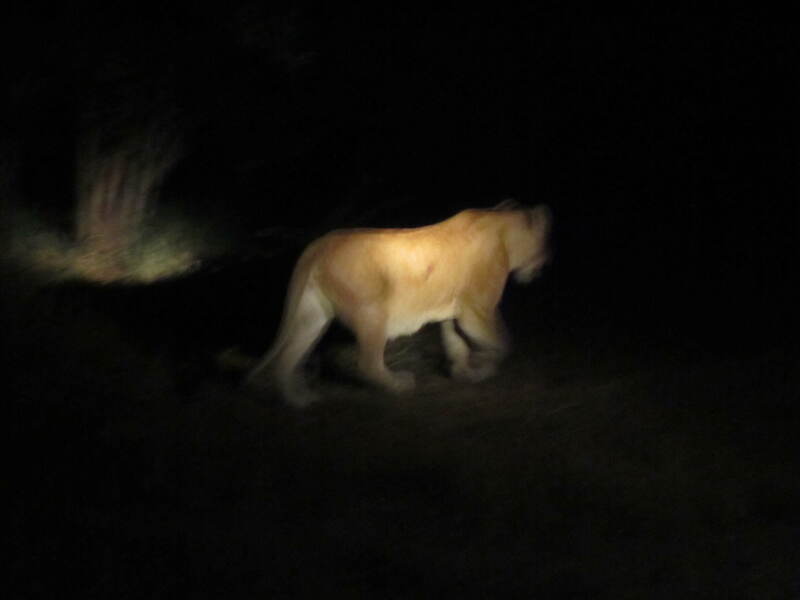 The lion followed several feet behind spraying and leaving his scent to mark his territory. 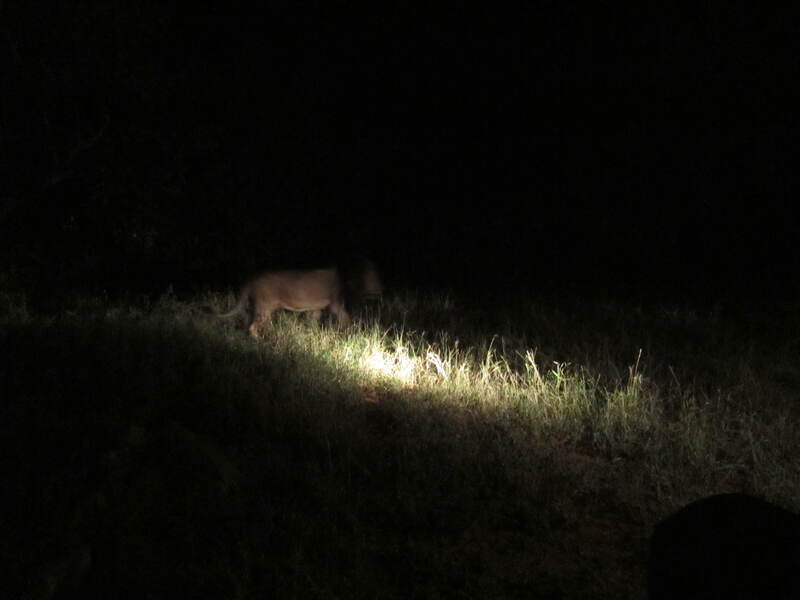 The scary thing about this was we only had one spotlight so that meant we only had the light on one of the lions at a time. At one point, we were parked to the side watching the lions when the male walked around the back of the truck to come out directly beside Joe. He was so close that Joe could have reached out and touched him. We held our breath! Not everything we saw was big! 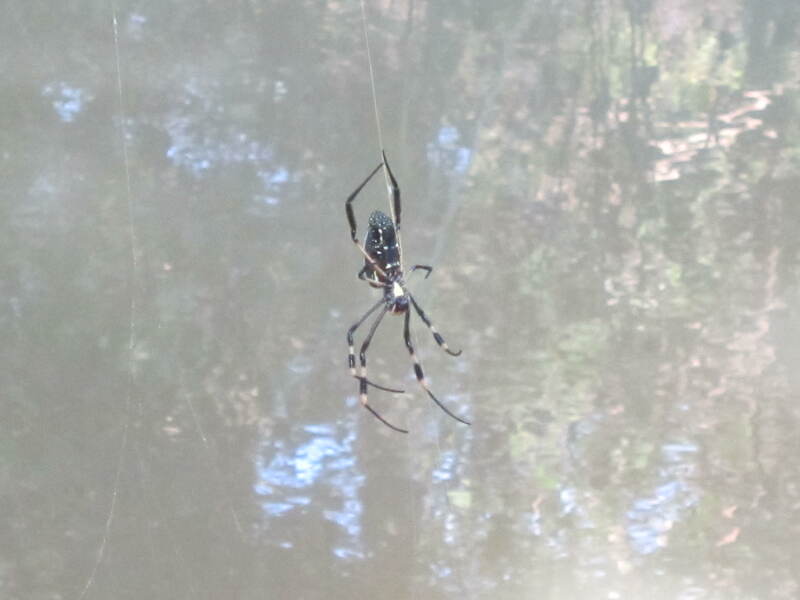 We were greeted by the largest spiders I have ever seen in my entire life. These could easily be as long as my fist and there were literally, hundreds. Often times, they’d stretch their webs across trees and while we were offroading, it wasn’t uncommon to hit one. Imagine being in the dark and feeling a web across your face and not know if one of these was on you? Their web was thick and strong like fishing line. It was for this reason, I never sat in the top row of the Land Cruiser! As promised, the first post of a few of our AMAZING South African vacation. The first part of our trip was the Safari which Joe and I were both looking forward to but really had no idea what the expect. We had hoped to see some animals, relax and experience a bit of luxury and Kapama Karula completely exceeded all of our expectations. I can’t remember exactly how I chose Kapama Karula but I do remember doing A LOT of research ahead of time. South Africa is full of safari camps and I wanted to make sure we chose what was best for us as more likely than not, it would be our only safari. 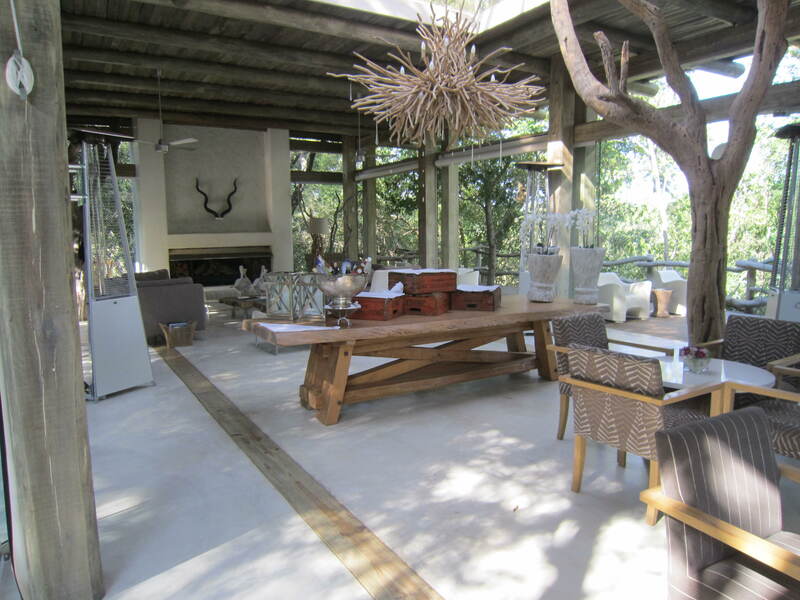 We wanted something nice as we’d been living in not the easiest of conditions so we ended up with Kapama. 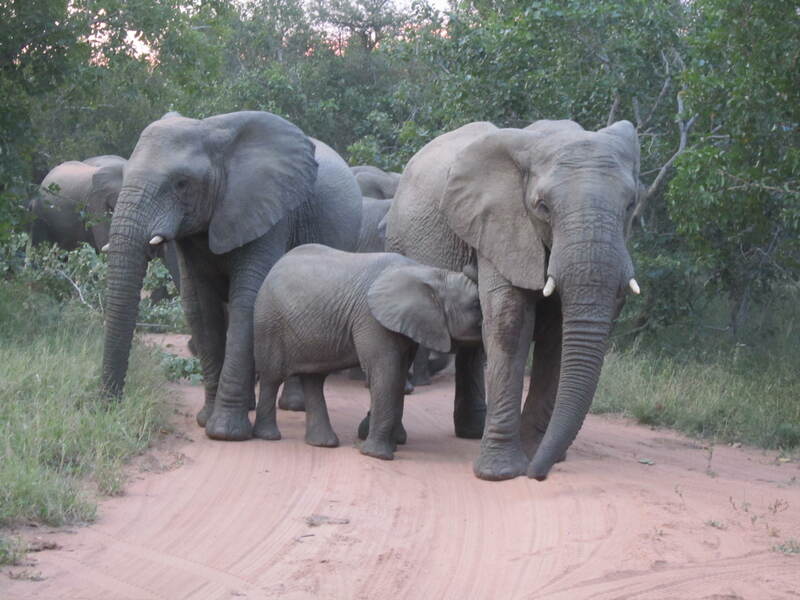 Kapama Game Reserve is 13 000 hectares of land which is part of Greater Kruger National Park. 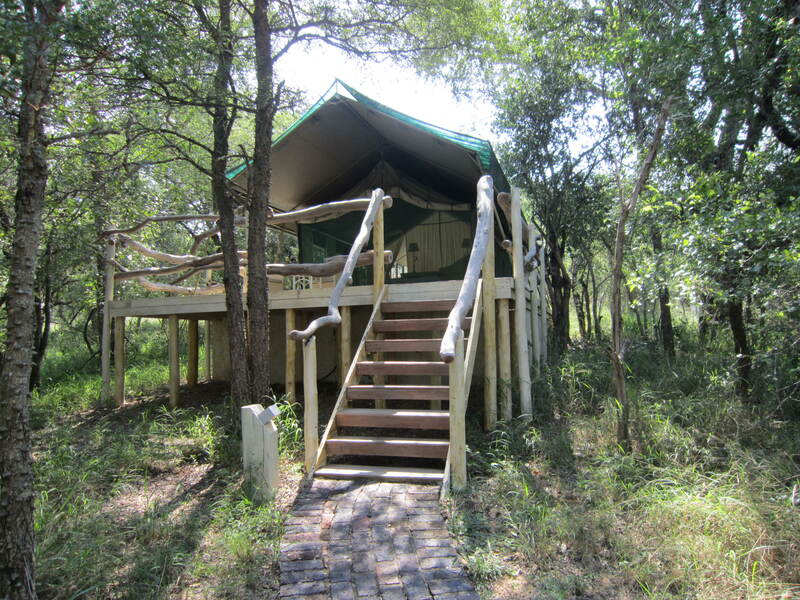 They have four separate bush camps in which you can choose to stay. 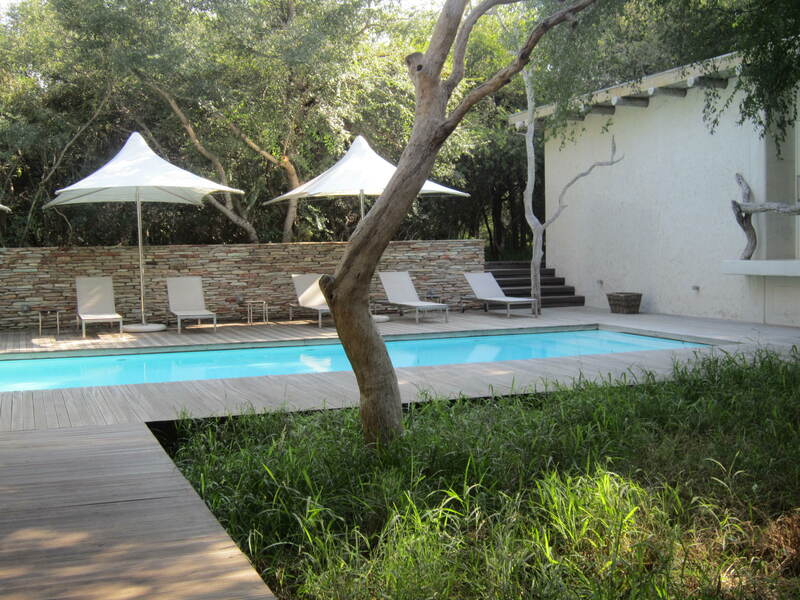 We chose Karula over the others because it is the smallest – with 7 luxury tents and 5 chalets. The interior of our tent. The front was pretty tent like, except with air conditioning! All of the tents and chalets are accessed through your own personal path and there is no one else around you. (Except maybe the monkeys!) 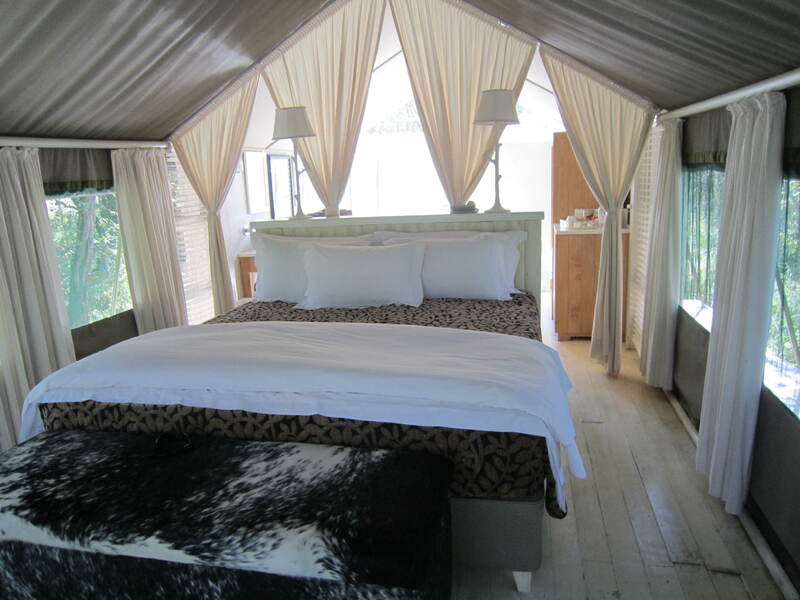 The front of the tent was tent-like while the bathroom at the back was completely built in. There was also an outdoor shower out the back. 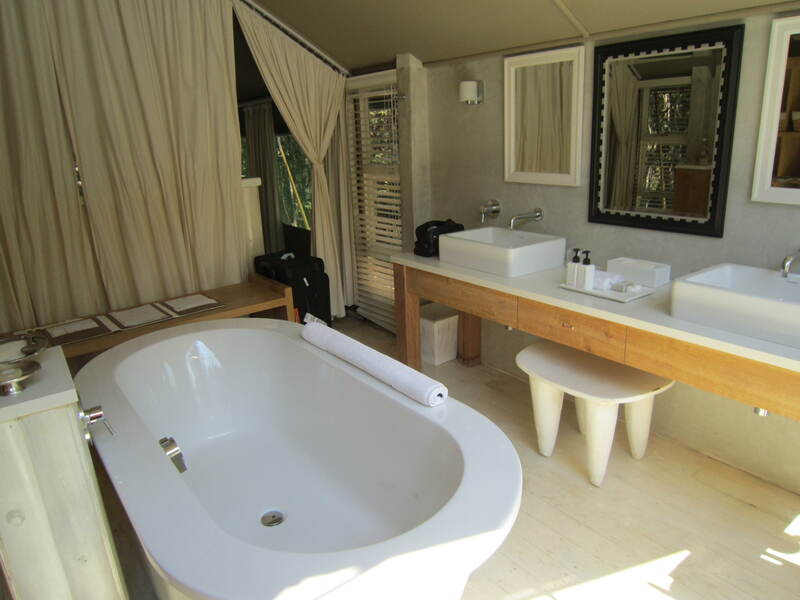 The bathroom at the back of the tent. The entire camp was serene and beautifully decorated. Even though we were quite busy all of the time, you couldn’t help but feel relaxed. Drinks were served here before and after our game drives. The pool overlooked a riverbed on the other side. The food was impeccable. The staff was wonderful and went out of their way to make sure that our stay was perfect. They would often come and chat with us about our trip and were so accommodating to anything we needed or wanted. Most of our meals were eaten here. By the end of the stay, Joe was talking of becoming our ranger’s apprentice and we both didn’t want to leave. All of the staff lined up when we had to depart to say goodbye and Joe and I were so reluctant to get in that vehicle but we knew we were on to Cape Town! As you know, we had 4 break-ins in our house since we’ve had it (October 1.) Not long after the 4th, Joe had to go offshore for a job and we weren’t comfortable having me stay in the house by myself even with 2 night guards so I moved over to the staffhouse which is really just a block of rooms at a hotel. While I was staying there, our neighbour’s (another expat family) house was broken into while he was sleeping upstairs. He heard it happening and scared them off. That kind of sealed the deal for us that it was no longer safe to live in our house so when Joe returned from the job, we continued staying in the staffhouse until our vacation. We’ll keep you posted and keep your fingers crossed that our living conditions improve quickly! I promise the next post will be about our fabulous vacation complete with pictures! It will have to come in several posts as we did and saw so much! Start saving your $$ because you must add South Africa to your travel plans! Well… not really this time! We got Joe’s passport and exit visa! We are currently sitting in Johannesburg International Airport awaiting our next flight to the other side of Kruger National Park to begin our safari! They have managed to track down the agent here in Port Gentil who has now informed us that Joe’s passport is still in Libreville. We are to board the flight to Libreville and then locate a man named Alexander in the airport who will have the passport. We might be spending our vacation in Libreville. Today is the day we are to depart to South Africa. We had issues with Joe’s passport and Joe getting here in time and the trip was subsequently delayed by one week. Joe has been working like mad this week to get all of his work done before leaving and everything seemed to be in order. His passport was sent to get the exit visa and we awaited its return Friday morning in time for our Friday evening flight. So it makes complete sense that the Oil Worker’s Union decided to go on strike TODAY! We heard rumours last night that it might happen at midnight but no one knew for sure. It was confirmed this morning when Joe arrived at the office to find all locals absent. (They eventually did show up to gather outside the gates and discuss the current situation.) Apparently, the plan is for all members on strike to gather at a common point this morning and march to the big oil companies here such as Total and Sogara Refinery. Their plan is to shut down those offices (I’m not sure how) and then to move on to the smaller companies, like Halliburton, Weatherford, etc. Currently, there are some expats at the office but a local has cautioned that it might be a good idea to head home soon because you can never be sure what might occur with a large group of protesters. Joe has set up his office at the dining table in the common kitchen of the staffhouse. Our one issue standing between us and South Africa is Joe’s passport. A local employee takes care of all travel and visa issues and she has sent Joe’s passport for the exit visa with a local agent. We tried to phone the agent this morning to get Joe’s passport back and I politely tried to explain our situation to him in French when he not-so-politely responds that he only deals with Mama H (the local employee, and yes, it does sound like the Mob) and that we are not to call him. We’ve passed it on to the HR manager here, an expat, and he went to the agents office to find him missing. He will continue to track him down and hopefully return with the passport in question. Barring any other major disasters and the return of Joe’s infamous passport with the exit visa intact, we’ll get the heck out of here tonight! I will update you of any new developments and I really hope that by the time our Western friends at home wake up and read this, that all is solved and we are preparing to head to the airport.